Nad's (Nads) Natural Hair Removal Gel - Painless hair removal from Pharmacy Discounter. Order Nads (Nad's) online here at Pharmacy Discounter. 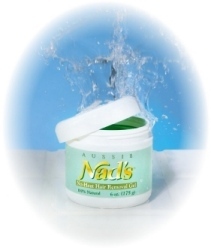 Nads (Nad's) Natural Hair Removal Gel. Nads (Nad's) hair removal gel is a completely natural, water-soluble hair removal product that can be used anywhere on the body. Unlike hair removal wax, Nads (Nad's) does not need to be heated. You just smooth on Nads (Nad's) gel and remove it with linen strips. Because Nads (Nad's) gel is made of all natural ingredients, Nads (Nad's) is perfectly safe for use around the eye area and anywhere else on the body. There is no mess with Nads (Nad's) (unlike hair removal wax), because Nads (Nad's) is water soluble. Cleaning up is easy and quick. Using Nads (Nad's) hair removal gel provides great results every time! Unlike other waxes and gels, Nads (Nad's) does not need to be heated. You just smooth on the Nads (Nad's) gel and remove it with linen strips. Nads (Nad's) gel is extremely effective without the use of heat, which means less sensitivity and less discomfort to your skin. Buy Nads (Nad's) Online here. Orders are dispatched within 24 hours, and sent by FREE fast worldwide delivery.